Syracuse, NY (June 13, 2018) - The Syracuse Chiefs brought the tying run to the plate in the bottom of the ninth inning against the Pawtucket Red Sox, but the PawSox closed out the game for a 5-1 win on a gorgeous Wednesday night at NBT Bank Stadium. Syracuse left seven runners on base in the game and went 2-for-10 with runners in scoring position. Pawtucket (31-32) scored first in the top of the first inning with one swing of the bat. With two outs and nobody on base, Mike Ohlman homered over the right-field wall to give Pawtucket a 1-0 lead. The Red Sox broke the game open in the fourth. Adam Lind singled, Sam Travis walked, and Ivan De Jesus Jr. singled to load the bases. Mike Olt followed with a single that scored Lind to put Pawtucket up 2-0. Two batters later, Dan Butler singled home Travis for a 3-0 Red Sox advantage. With the bases still loaded two batters after that, Cole Sturgeon singled to right field to score both De Jesus Jr. and Olt and make it a 5-0 ballgame. Syracuse (28-35) scored its lone run of the game in the bottom of the sixth. Bengie Gonzalez led off with a double. Andrew Stevenson followed with a single to put runners on first and third base. Adrian Sanchez then grounded into a fielder's choice where Stevenson was out at second, but Sanchez was safe at first and Gonzalez scored to trim the Pawtucket lead to four, 5-1. The Chiefs loaded the bases in the bottom of the ninth inning with one out, bringing the tying run to the plate, but Red Sox reliever Robby Scott induced a pop out and a fly out to end the game and secure the win for Pawtucket. 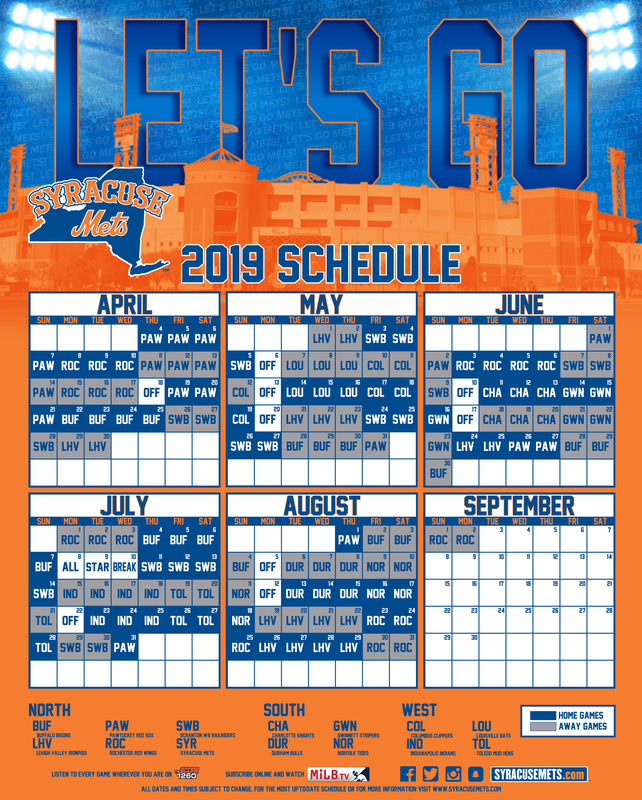 Syracuse continues its seven-day homestead with the start of a four-game series against the Scranton/Wilkes-Barre RailRiders on Thursday night at NBT Bank Stadium. RHP Phillips Valdez is scheduled to start for the Chiefs while New York Yankees top pitching prospect (per Baseball America) LHP Justus Sheffield will be on the mound for the RailRiders. First pitch is set for 6:35 p.m.